As a unique commodity, the price of gold fluctuates with the value of the U.S. dollar. Warren Buffett has never been a fan of gold. The Oracle of Omaha has often derided the precious metal, as it offers no productivity. If you purchase shares of a successful company, that company can provide a steady stream of income, which, compounded over many years, will generate significant additional wealth. Gold, in contrast, simply sits there. That's fair criticism -- on the other hand, the consistent value of gold is also its greatest attribute. An ounce of gold never changes. For investors interested in gold, that means keeping a close eye on the value of other things -- in particular, the value of paper money and the U.S. dollar. For most of history, gold has anchored the global money supply. From 1900 to 1933, the value of the U.S. dollar was derived from gold directly: a U.S. dollar was legally defined as just over 1.5 grams of the precious metal. But the U.S. ended gold convertibility during the Great Depression, and abandoned the gold standard entirely in 1971. From then on, gold has simply been another commodity, albeit one with a few unique properties. The value of oil or lumber or coal may shift with the global economy, as demand for those commodities depends on their popularity within the larger economic chain. In the 1850s, whale oil was a valuable commodity, but its relevancy receded with the emergence of fossil fuels and electricity. If solar energy and electric cars eventually become standard, the value of crude oil could likewise plummet, as demand slowly falls by the wayside. Gold, in contrast, has no real industrial use. Gold's value rises and falls not in relation to its demand, but in relation to the value of the currency it's valued in. When a currency weakens, gold's price goes up. When a currency strengthens, gold's price goes down. Although the price of gold appears to rise or fall, it isn't the value of gold that has changed -- it's the value of the currency. In essence, buying gold amounts to a bet against the value of the U.S. dollar. The U.S. dollar index compares the value of the U.S. dollar to a basket of foreign currencies, while the SPDR Gold Shares derives its value directly from the price of gold bullion. When the U.S. dollar was at its weakest, SPDR Gold Shares traded near its height. As the dollar has been strengthening over the last two years, the price of SPDR Gold Shares has fallen. For gold stocks, the story is much the same -- the recent rise in the relative value of the U.S. dollar has proven to be devastating for shareholders. Although buying shares of a gold miner is quite different than buying the commodity itself, the financial performance of these firms depends on the price of gold. These companies generally derive their profit by taking advantage of the spread between gold prices and the cost of mining. When gold prices tumble, gold stocks almost always decline in tandem. Consider the recent performance of Goldcorp (NYSE:GG), one of the largest and best-known pure gold miners. 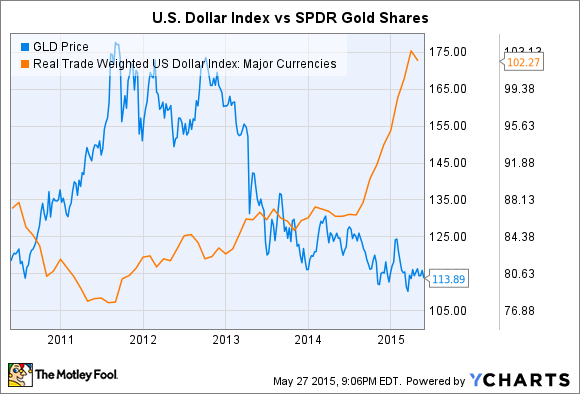 Like SPDR Gold Shares, its share price has fluctuated in inverse relation to the U.S. dollar index. Gold miners can mitigate their exposure to the dollar by engaging in a variety of different strategies. Some firms, such as Newmont Mining (NYSE:NEM) mine other metals in addition to gold (in Newmont's case, copper). 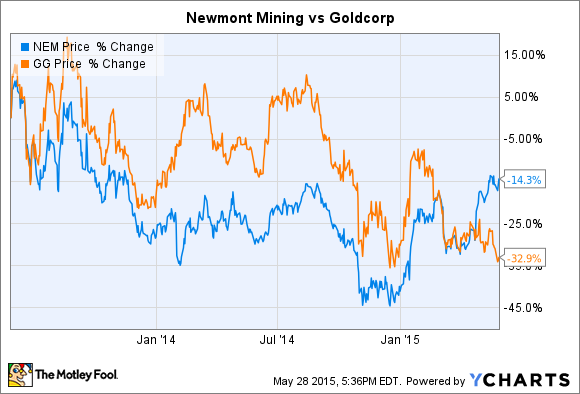 Newmont hasn't been a great stock to own over the last two years, but it's certainly outperformed Goldcorp. Another option is to engage in hedging, establishing contracts to sell gold at a fixed price at some point in the future. If the dollar strengthens and the price of gold falls, these contracts can protect a company's bottom line. However, many gold firms -- particularly pure-play gold firms -- intentionally avoid hedging. Goldcorp proudly boasts that it is "100% unhedged," for example. Rival Barrick Gold spent almost $3 billion in 2009 to rid itself of its gold hedges. Given gold's unique status, investors are often interested in using gold stocks as a way to hedge their portfolio against dollar weakness (or to bet against the strength of the dollar explicitly). Hedging limits a company's downside, but also caps its potential upside. If a significant percentage of your portfolio is in gold stocks, you should hope that the value of the U.S. dollar falls (and by extension, the price of gold rises). 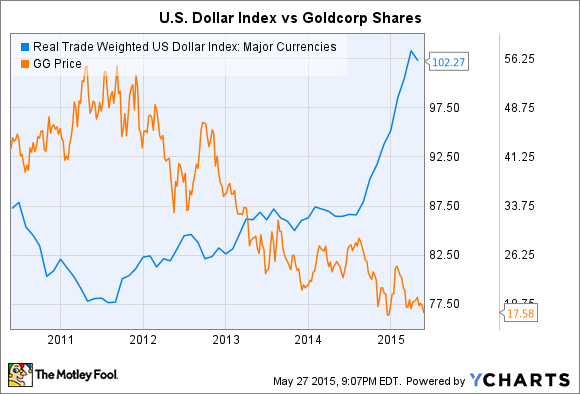 A strong dollar can wreak havoc on gold prices, and, by extension, gold stocks.